Gustavus Holst was born in Cheltenham, Gloucestershire, on September 21, 1874. His father Adolph von Holst was a renowned pianist and his mother Clara was a student of his with whom he fell in love and married. Clara died when Gustavus was eight years old. Gustav Holst is best known for his magnificent orchestral composition, The Planets, still very popular in Britain today. He wrote it in 1914. Young Gustavus was a sickly child. His eyesight and chest functions were weak. He also suffered from neuritis, which affected his learning the piano and other musical instruments. His hands were shaky. This prevented him from playing an instrument for any length of time. As a result, he was unable to attend a prestigious conservatory for further training. He was appointed to play organ and act as a choirmaster at Wyck Rissington. He gave his first official performance with his father at a concert where he played the role of the pianist. The audience of that show called him Gustav which he opted [for] instead of his original name “Gustavus”. In 1893, he was able to enter the Royal College of Music, with financial help from his father. His first job after graduating in 1898 was with the Carl Rosa Opera Company where he coached and played piano during rehearsals. In 1900, he wrote a symphony performed to great acclaim in 1902. He married Emily Harrison in 1901. He decided to teach music. After a period spent at a school in south London, the well-known St Paul’s Girls School appointed him Director of Music. He worked there until his death in 1934 of a duodenal ulcer. His funeral was held at Chichester Cathedral on the south coast. Composer Vaughan Williams played Holst’s music during the service. First Suite in E-flat for Military Band, Second Suite in F for Military Band, I vow to thee, My Country, St. Paul’s Suite, In the Bleak Midwinter, A Choral Fantasia, Two Eastern Pictures, The Wandering Scholar, First Choral Symphony, Ave Maria, A Moorside Suite, In Youth is Pleasure, The Magicianand Hammersmith among others. I vow to thee, My Country and In the Bleak Midwinter are popular hymns to this day. 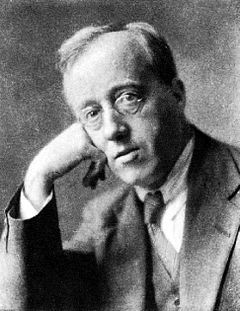 Today, Holst is still considered as one of England’s greatest composers.